BAM!™ and AMINO STRONG™ are two of the multifunctional products in our exclusive GNC line released a few months ago. BAM!™ is a 2-in-1 pre-workout and lean muscle-building formula that provides a smooth release of energy and an increase in performance. AMINO STRONG™ is a 3-in-1 muscle-building, pump and recovery formula that keeps muscles full and hydrated during workouts. Together, this pre- and intra-workout stack provides a one-two punch of clean, smooth energy and pumps that will last throughout your entire session. No jitters – just focus, power and endurance. Take one scoop of BAM!™ and one scoop of AMINO STRONG™ before you head to the gym. This muscle-building combo will help boost your strength, promote lean muscle mass and support recovery. Whether you’re new to fitness or an experienced veteran, we understand that the number of supplements available can be overwhelming. That’s why we set out to simplify things. 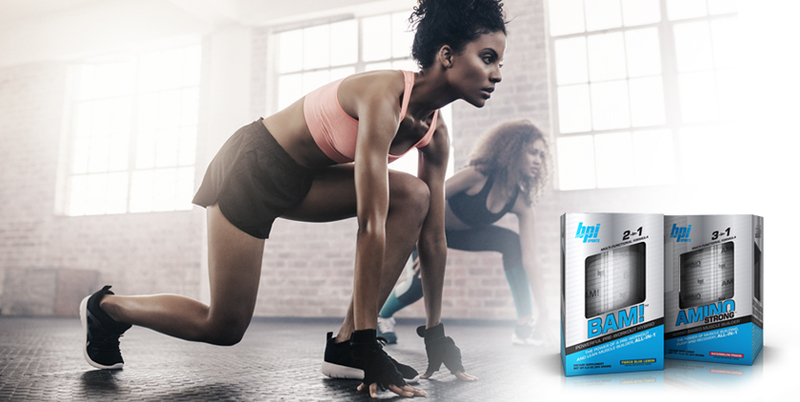 With the help of our Science & Medical Advisory Board and Team BPI athletes, we created these two multifunctional products to help you reach your goals without needing to take as many supplements. As you can see, BAM!™ and AMINO STRONG™ have the power of two to three supplements in one, allowing you to get more out of each scoop than ever before. In addition to being multifunctional, each product uses our one-of-a-kind Liposomal Matrix Delivery System™. This cutting-edge technology helps transport the important nutrients to your muscle cells faster and more efficiently. Just because you consume a supplement, doesn’t mean it fully absorbs in the body, but by bypassing the destructive elements of the gastric system, the Liposomal Matrix Delivery System™ optimizes the absorption rates and oral bioavailability of both pills and powder. That’s why it is the anchor of each one of these premium products. Pick up your BAM!™ and AMINO STRONG™ today at any GNC location or on GNC.com.